New deposits of well-known gemstones or of some new and unusual gems and minerals are being discovered on a routine basis, which obviously reaches the world gem markets, such as Jaipur. Similarly, new synthetics and treatments are under regular developments and hence, their identification has become more challenging and complicated than ever before. All the reports issued at GTL are based on a thorough research using ‘years of experience’ on the many analytical methods including visual examination with the aid of traditional gemmological tools and sophisticated scientific spectrometers. The gemmologists at GTL have a combined work experience of more than 25 years and each year, thousands of various types of gemstones go through their eyes. Traditional gemmological tools and methods play an important role in determining the nature of mineral species, which mainly involve determining the physical (such as specific gravity, hardness, cleavage, etc.) and optical constants (such as optic character, pleochroism, refractive index, birefringence, optic sign, absorption spectrum, fluorescence reactions, etc) and comparing with a table of constants, available in common gemmological texts. These methods are still widely used in most of the gemmological labs, but they fail to provide answers to many questions raised by the advanced and complex methods of treatments and synthesis of gemstones. 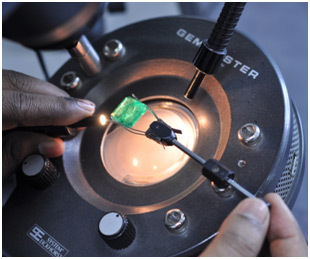 They, however, nicely complement the sophisticated and advanced analytical tools, which have now become essential components of a modern gemmological lab, such as Gem Testing Laboratory, Jaipur. 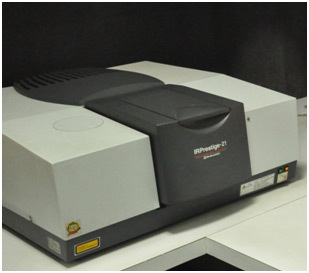 Some of the sophisticated methods of analysis used at the Gem Testing Laboratory, Jaipur include Fourier Transform Infrared (FTIR) Spectrometry, Laser Raman Spectrometry (LRS), Energy Dispersive X-Ray Fluorescence (EDXRF) Spectrometry, Ultra Violet- Visible- Near Infra Red (UV-Vis-NIR) Spectrometry and DiamondView imaging. The microscope remains the most important tool in gem identification – it is the ‘heart’ of a gemmological lab. Detailed and careful observations made under a microscope help a gemmologist to decide on many aspects of a gem regarding its type, origin, treatments, etc and assists other techniques in validating the data. At the Gem Testing Laboratory, every analysis is started with a detailed microscopic observation. Due to a typical crystal structure with specific pattern of molecular arrangement, particular gemstones or minerals tend to produce a characteristic absorption and transmission patterns on interaction with light. FTIR typically uses infra red light to study such features. 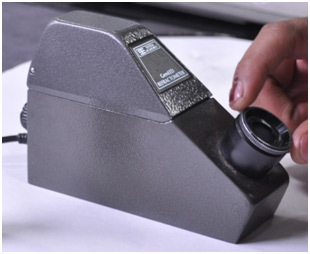 At GTL, FTIR is commonly used to identify unknown gems and minerals by their fingerprint pattern, separate natural and synthetic emeralds, rubies, sapphires, amethysts, etc, determine absence or presence of treatments in rubies, sapphires, emeralds, turquoise, corals, etc. LRS is based on the Raman Effect, produced when a laser strikes a molecule and interacts with its bonds. Some of the light is scattered while some are re-emitted producing a characteristic spectra, which is a ‘fingerprint’ for a particular substance. 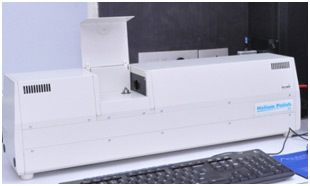 UV-Vis-NIR spectrometry is based on selective filtering of wavelengths through the sample; the absorbed wavelengths caused due to electron defects or chromophoric elements are displayed in the form of a graph and expressed in comparison with the incident light. At GTL, UV-Vis-NIR spectrometer is used to identify a gem species / variety, especially in case of separation of emerald from green beryl or ‘cuprian’ tourmaline from ‘non-cuprian’, or the type of garnet; it also helps to differentiate synthetic from natural sapphires or spinels, turquoise or corals their imitations, etc; it is also very useful in separating treated corals, jadeites, turquoise, diamonds, etc. 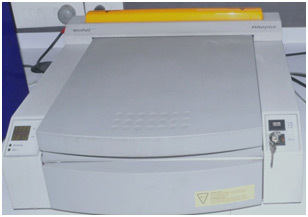 X-ray fluorescence spectrometry is used to determine the bulk chemical composition of the samples' surface. When a substance is exposed to x-rays, the electrons of the atoms get excited to the higher energy level and on falling back to the ground state, emit radiations in the form of fluorescence, which is recorded by the detectors. The emitted energy of excited elements is displayed as peaks. 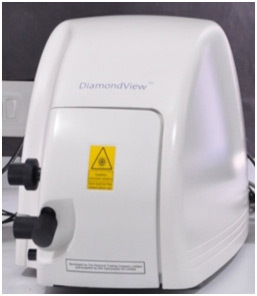 DiamondView basically is an imaging system, which uses the short-wave ultraviolet light below ~225 nm. The fluorescent reactions are observed through a CCD camera, which display them on the monitor through software. 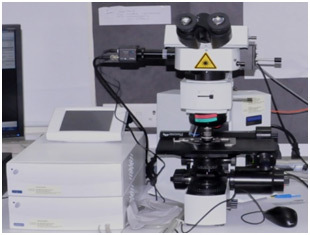 It helps in studying the growth pattern of the sample’s surface or sub-surface up to few microns. It also assists in observing 'phosphorescence' of a sample. Although, DiamondView was created to study and separate synthetic from natural diamonds, it has proved to be quite useful for identifying treated and synthetic counterparts of rubies, sapphires, emeralds, etc. The scanner basically measures dimensions of cut & polished diamond and gemstones, where it scans angles of inclination and position of each facet and measures each facet edge to create a 3D wireframe model. The software calculates exact proportions and symmetry of a cut diamond, thereby providing information on the performance of light within a cut diamond.